As I wrote this poem, I was struck by the similarity between aiming- “shooting”- a camera and aiming a rifle- looking through the lens or scope to pinpoint unsuspecting individuals and claim them. This macabre connection would never have occurred to me anywhere else except here in the Middle East. Normally, photography is a pleasant, innocent diversion. Here, however, especially when photographing women, it takes on different overtones. You may have noticed that most of the images I have of women here are from the rear or from a distance. They regard being photographed as an invasion of privacy, so I have tread lightly. But we women are always curious about each other. And these Muslim women are no different. As we pass, shopping in stores, primping in restrooms, and dining in restaurants, we respectfully nod greetings while surreptitiously taking in what details we can about appearance and demeanor. While these exchanges are silent, the bond we share as women is palpable. In a previous post (See Five Frequently Asked Questions, January 23, 2012), I explained that in Dubai and Doha, where there are fewer restrictions, women can drive and go places alone. I often see groups of women out enjoying themselves together, sharing shisha pipes, laughing and all talking at once- the way female friends do! Unfortunately, while here I have yet to develop a genuine friendship with any Muslim women. What I know of them has come from books, films, scripted talks in both large and small gatherings, and personal observations. They certainly care about their appearance and for centuries have used all sorts of exotic, natural substances to soften their skin and to accentuate their features. Freya Stark refers to their use of henna as a decorative cosmetic and as a hair dye. She describes how they bathed with the powdered leaf of the Sidr tree, a soap of clay and dried rose petals. Other toiletries included saffron powder, frankincense, rainwater, pounded almonds and pearl dust. They traditionally used an Indian bark called “dairam” to darken their lips and, still today, they apply kohl (a powdered antimony sulphide) around their eyes for both the dramatic effect and for protection from the desert glare. Today Arab women combine these time-tested treatments with the vast array of beauty products available at the upscale stores in the Mall of the Emirates, Dubai Mall, and Vellegia Mall in Doha. This is evident, given the crowds of elegant Arab women I see making purchases as I browse there myself! The passage below, from a poem by Rosalind Clark, “To a Berber Woman”, gets at the essence of one of the most frequently debated issues about Muslim women: their clothing. Or are you- more free than I? What do clothes reveal? What do clothes conceal? Must our clothing define us? Can we avoid that? Do Muslim women dress this way by force or by choice? The phrase “fashion statement” is a loaded one, in any culture, but particularly here. And, in truth, the clothing does not tell the whole story of the woman inside by any means. You cannot make any assumptions about a Muslim woman’s beliefs or her relationship with her husband based on her clothing. Young designers are being playful and adventurous in their creative work, appealing to Muslim women from the USA to Jordan and Egypt and the Arab Gulf. An October 14, 2010 article by Raja Abdulrahimin in The Gulf Times magazine supplement, Time Out, from Qatar, “Pushing Cultural Boundaries with Designer Hijabs”, describes the popular head scarves crafted by Marwa Atik in southern California , of colorful silk, cotton, and chiffon, with fringes, ruffles, zippers, stitched patterns, and frayed edges. A blog called “hijabulous”, now known as “hipjabi”, highlights a new attitude toward conventional Muslim attire. Wear it, but spiff it up. Make it unique. Make it your own. I enjoy seeing the many forms of decoration added in Dubai and Doha, from sequins to embroidery. On Valentines Day, a young woman standing next to me in line at the grocery store (the ubiquitous French Carrefour) had sewn a red heart on the sleeve of her abaya! 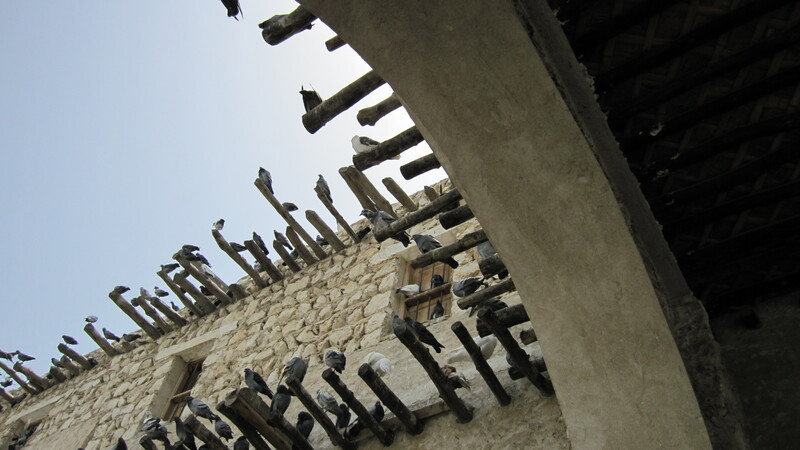 The mixed media art installation below, “Tipping Point,” by Yara El-Sherbini, was featured in the Bastakia Art Fair, Dubai, 2009. Another hot topic is how much hair and face to cover. High profile women, such as Queen Rania of Jordan, Princess Hiya of Dubai, Her Highness Sheikha Hind, daughter and political advisor to Emir al Thani of Qatar, as well as his wife, the powerful Sheika Mozah of Qatar rarely (never?) cover their faces in public and always leave some of their heads uncovered, except in mosques. This is controversial, even risky. They are ferociously criticized by conservative Islamists. 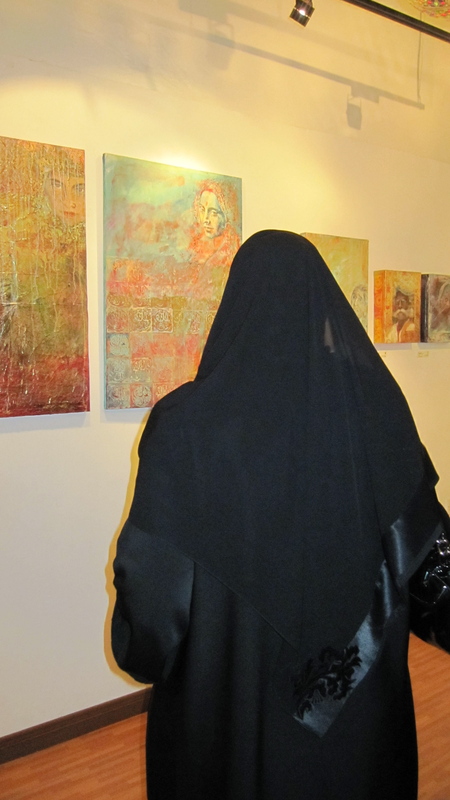 Whether or not the veil is worn for cultural and personal reasons or religious ones has become a volatile issue. Queen Rania stirred up antagonism when she told an Italian newspaper in 2007 that imposing the hijab on women actually goes against the teachings of Islam. On the other side there are Muslim women from France to Egypt who resent being told they cannot wear headscarves. When Sayed Tantawi, the Grand Sheikh of Al-Azhar, a 1000-year old Islamic university in Cairo, commanded a student in an all-girls’ school he was visiting to remove her niqab because it represents “too extreme an interpretation of Islamic modesty” (The Economist, October 17, 2009) , there was outrage from both liberals and conservatives. There is a fair amount of ritual around the first donning of the abaya. These have been recounted in several excellent coming-of-age and rite-of-passage books written by Muslim women. (See the Recommended Reading at the top of this blog.) Usually the writers are speaking out because they dislike the transition from free-spirited child to repressed young woman, and they are rebelling against the double standards. There are many women, however, who welcome this symbol of adulthood. Watching families shopping, it is easy to see how little girls, wearing western-style frocks or jeans, look up to their mothers, mysterious and regal in their long gowns. 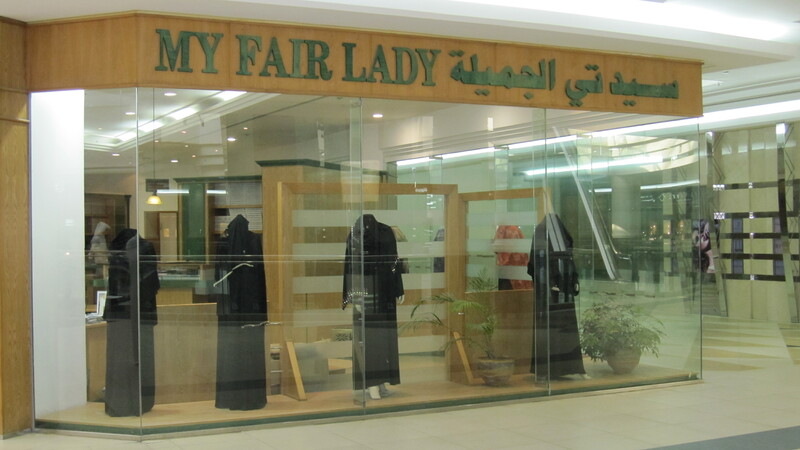 There is a certain glamour in the abaya. Indeed the formality of these women can make the more casual dress of westerners seem shabby by comparison. 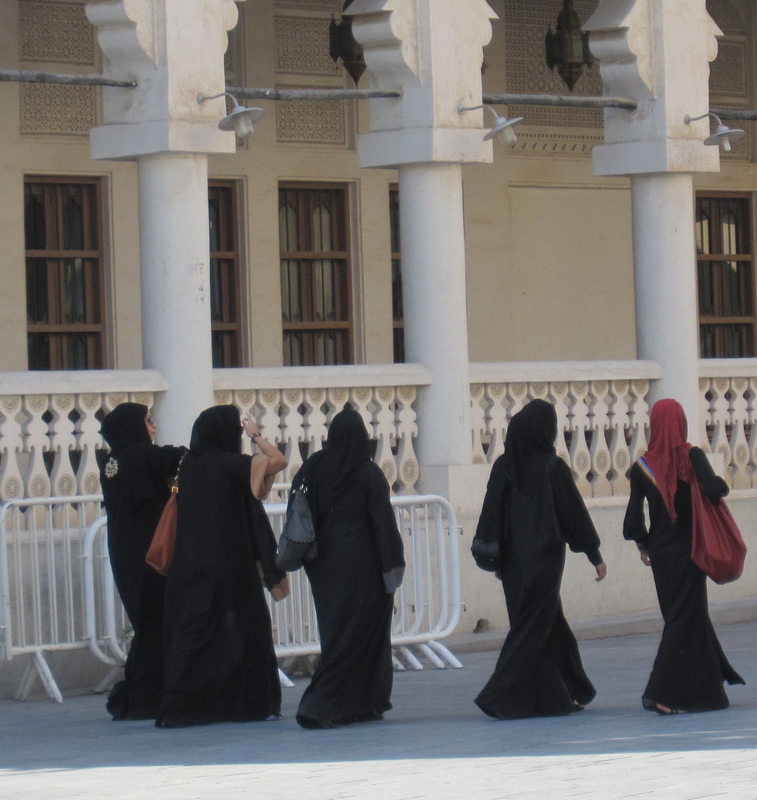 An American woman I met here remarked: “These Qatari and Emirati women do not walk. They glide. They float.” Indeed they do move with grace and dignity, a sense of ease, aware of their beauty. Their modesty enhances their allure, thus their power. A different view. I am tempted to pick apart the hidden messages in this comment, the underlayers- forgive the pun. But I will take it at face value. Devout Muslim women (and men, of course) do insist that the protections put in place for them are “to promote our liberty and safety, not our submission.” This comment was made by a speaker at a gathering I attended in Dubai. She enjoys a certain degree of anonymity and not being hung up on having clothes express her identity. These are public clothes, however; inside the privacy of their homes, they can wear whatever they like. So, greetings my silent foreign friend. I am curious, but I will not judge you. I do not want to impose my way on yours. I can only look into your eyes and hope that you are safe. I, too, am a woman, a daughter, a sister, a wife, and a mother. I can relate to you. And I wonder, which of us is more free? This post is especially wonderful…where are you now?